A poor black girl from Mississippi, from a broken home, abused as a child, had a dream and believed she could make it come true. She became an award-winning talk show host and one of the richest people in America: Oprah Winfrey, Talk Show Host. These are famous people and many know their inspirational stories. But dig deeper into the stories of people you know, and you will find many tales of triumph over disasters: I once met a woman who had been badly injured in an automobile accident. While lying in the hospital for the year it took her body to mend, she thought, “How am I going to work? I need to make money.” She thought about all the limitations of her body and the things she couldn’t do. Then she concentrated instead on what she could do: She could talk on the telephone. So she started an executive search firm from her hospital bed. She worked the phones every day, matching people who needed jobs with companies that needed employees. When finally she healed, she continued her work, and expanded her business into a very successful, money-making company. If they can achieve their dreams in the face of these obstacles, so can you. In a world where fad items like hoola hoops, pet rocks, and virtual pets can make millions, anything is possible. 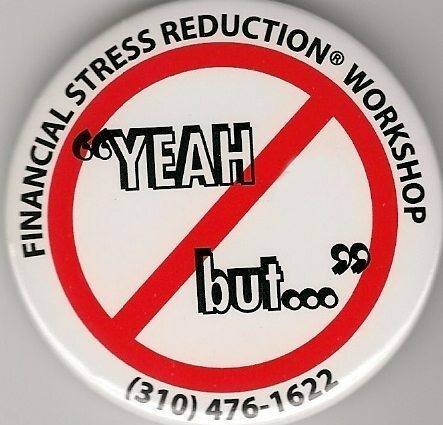 I made these “No yeah, but” buttons for my Financial Stress Reduction Workshops back in the 90s – whenever someone in my class wanted to give an excuse for why they couldn’t succeed, or why the idea wouldn’t work, or their case was different because, or they tried it once back in 1982 and it didn’t work – I’d throw them a button and they had to wear it for the rest of the session. Sometimes people left class wearing 7-8 buttons! Oh, you may be right about some of your reasons why things aren’t working. But looking at the door that’s shut instead of searching for the one that’s open just keeps you stuck in “I can’t”. There’s no success in your future if you stay there. What you want to do is brainstorm all the ways in which you might succeed if you’d just try it. One of those things is bound to work – or lead you to another thing that’s bound to work.